This week is a significant week because I was pregnant for 37 weeks with HG, and it was at my 37 week appointment that I was told I needed to be induced. HG has been out and about with us for the same amount of time she was developing in the womb. Hattie-Grace has been talking so much the past few days. She is constantly babbling. She has also started mimicking talking too, by moving her mouth but not making any sounds. Marty thinks she says "ba,ba" for Mama right now, but I'm not too sure. She just started noticing shadows this week. 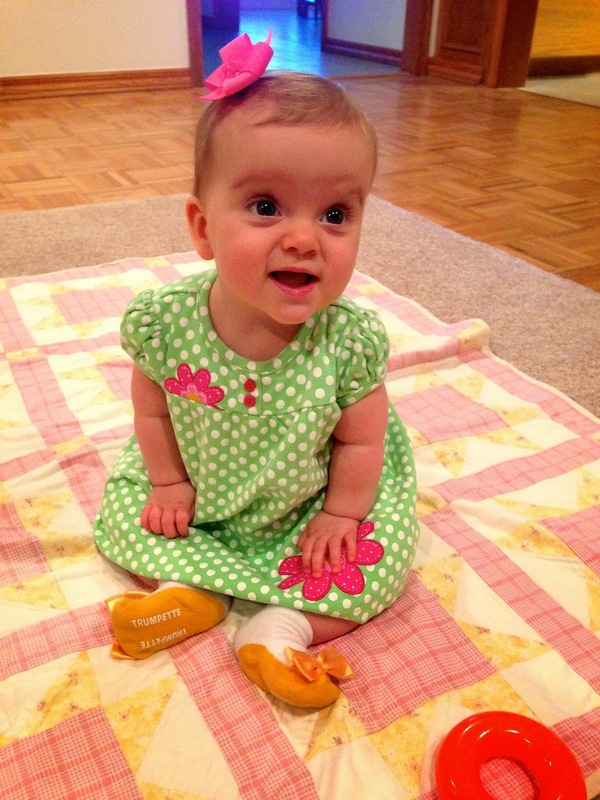 Hattie-Grace is still teething and it is so hard to see her in pain. One bottom tooth has broken through the gum line, and I think another is working now. 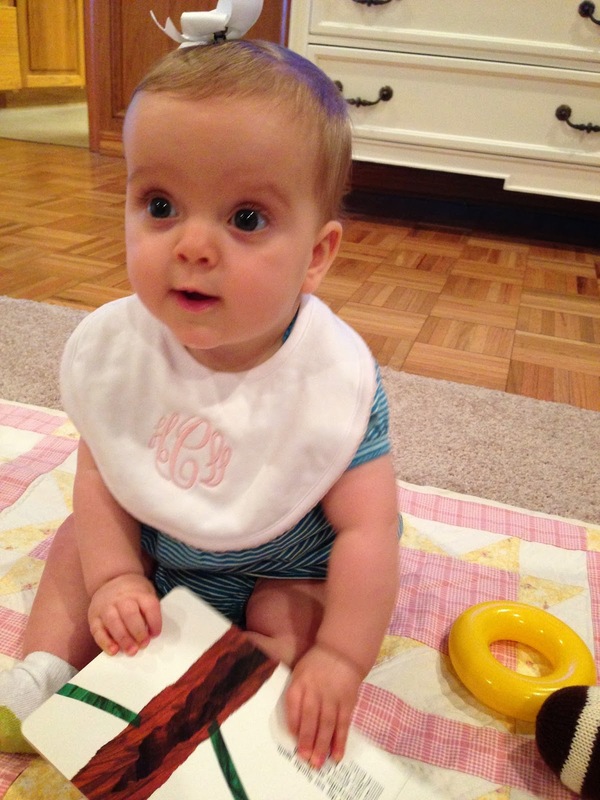 She has little to no appetite for solids, and is chewing on everything in sight. 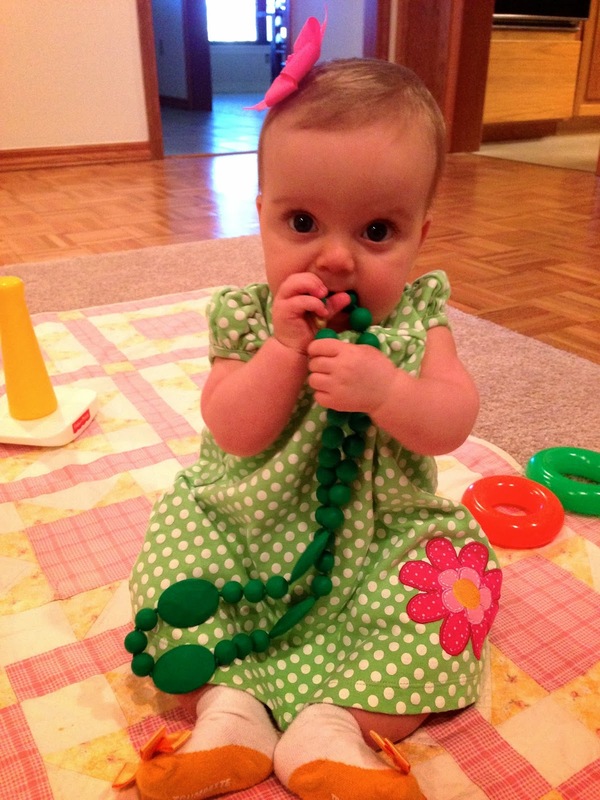 She loves the Chewbeads my sister gave me. 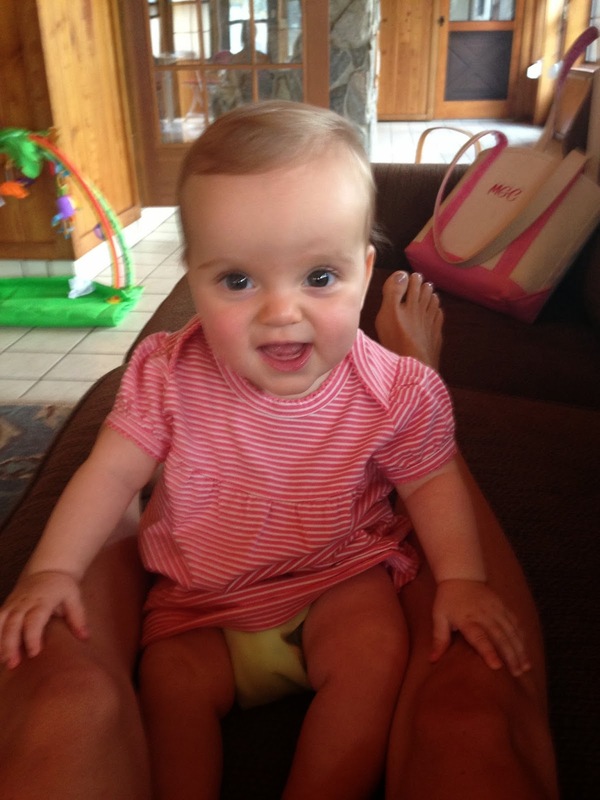 This week we have been going through teething pains! No fun. It started out as cold symptoms... a stuffy nose and cough, trouble sleeping and staying asleep. It has been about a week now, and although the stuffy nose is gone, the pain is still there. We have a little tooth bud, and she is napping better during the day. She still struggles to fall asleep at night, but hopefully that will end soon too. 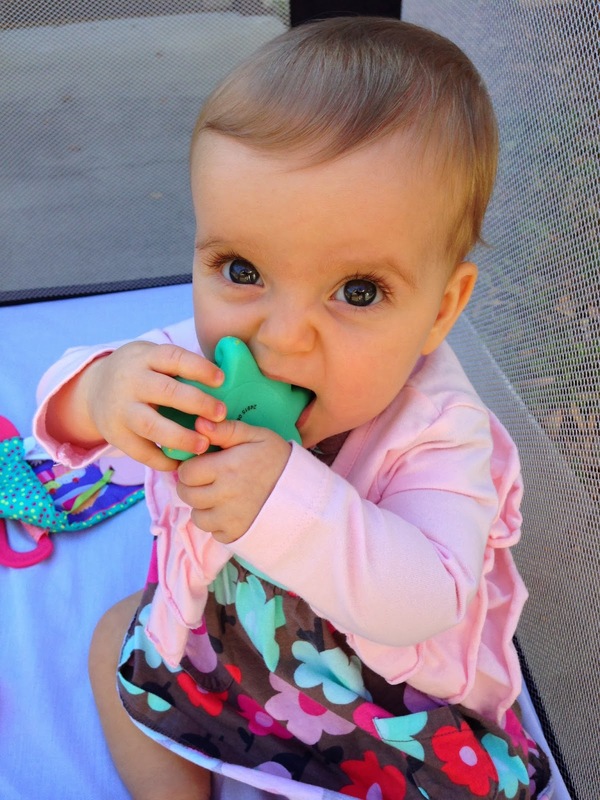 Teething is not for the faint of heart. I had no idea it was such a big deal in their little world. HG tried yogurt this week. 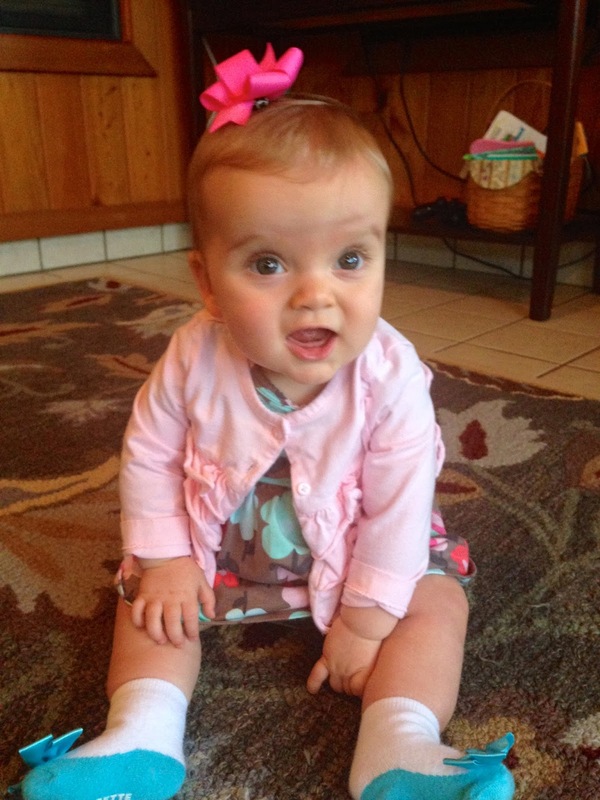 The most fun part of this week was that Hatley-Grace learned how to wave "hello" and "bye-bye". 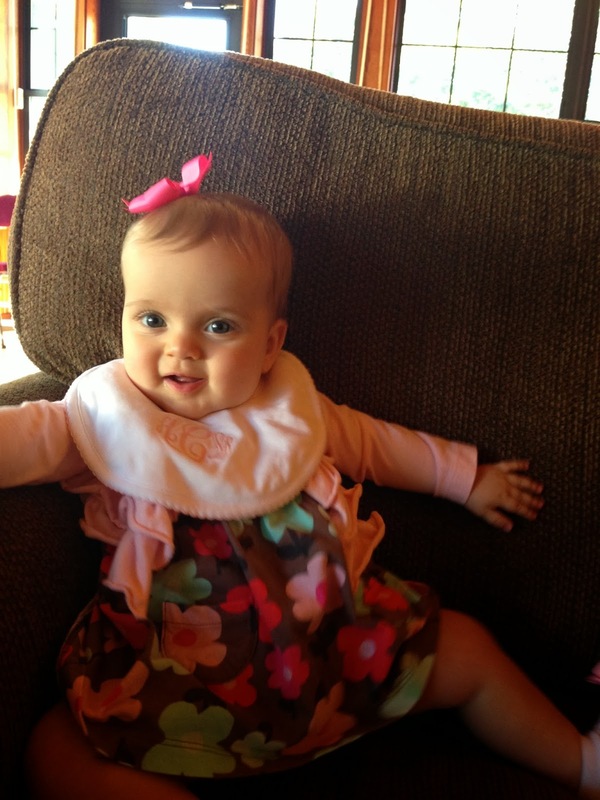 We raise her hand and say, "Say hello/bye-bye Hattie-Grace", and she will open and close her fingers a few times. Then we praise her, squeal, jump up and down, like she is the best thing in the whole wide world! We are easily amused! Thank you for providing us with hours and hours of reading entertainment. 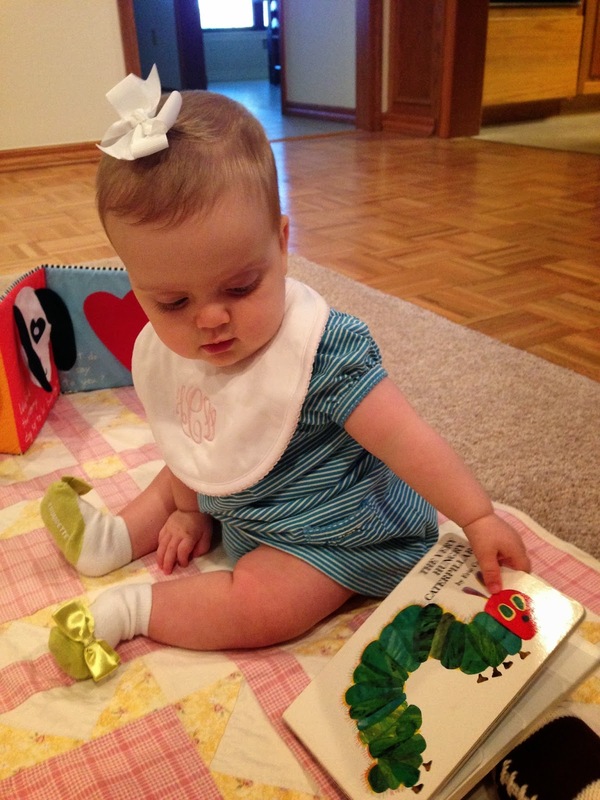 Hattie-Grace could read and listen to The Very Hungry Caterpillar for hours. 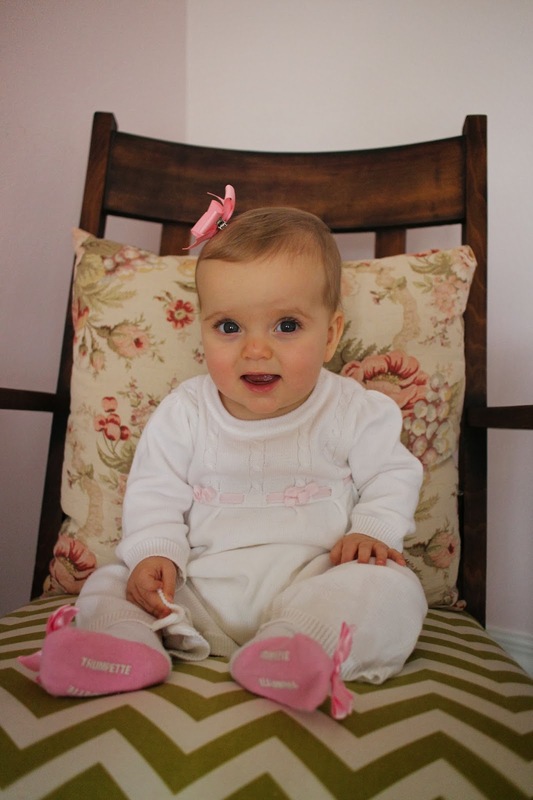 Today marks 8 sweet months we have had the joy of getting to know Hatley-Grace. 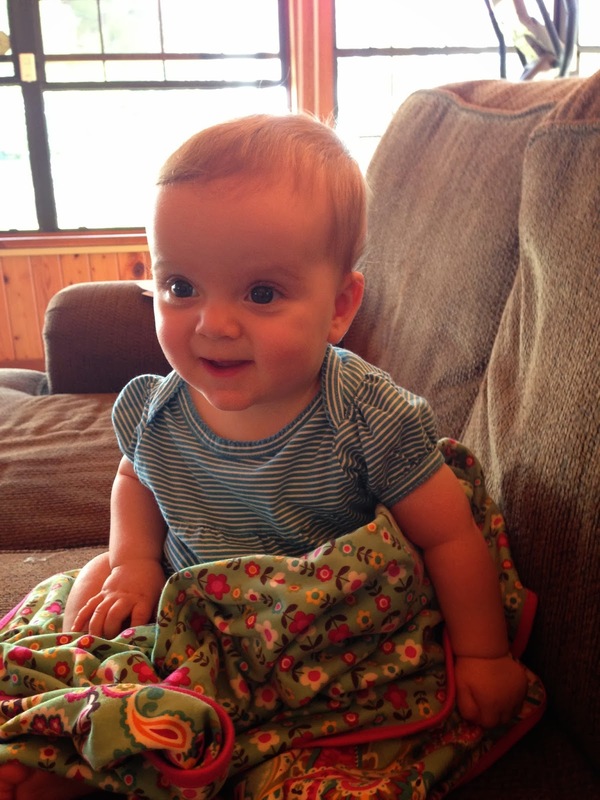 She continues to be a joyful little girl, and her personality is starting to develop even more. HG nurses about 7, 10:30, 2, 5, 7. She has not settled into a true 4 hour schedule yet. 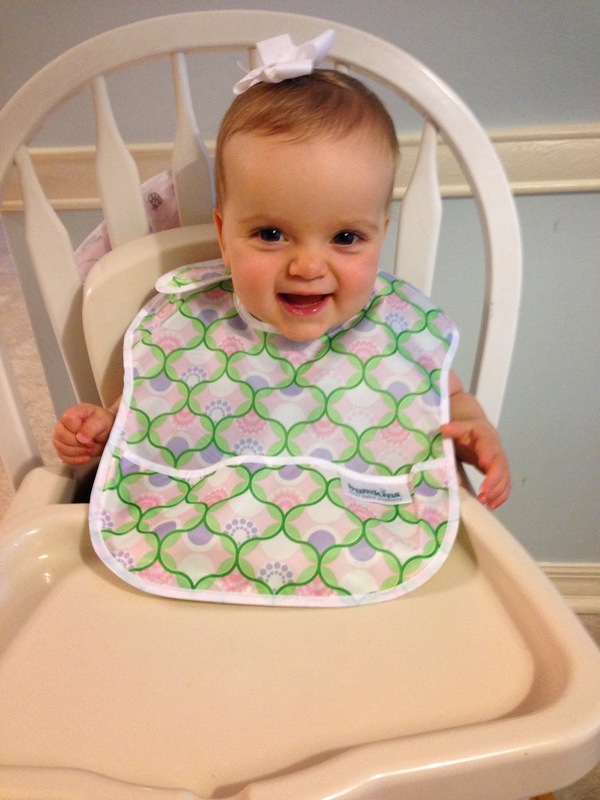 She is eating solids 2-3 times a day, depending on the day and our schedule. We were going to dive into some new foods, but a recent struggle with constipation has has here eating lots of pears and avocados recently :). She doesn't have much of a sweet tooth yet, as she is not a big fan of apples or pears. She eats the most of avocados and carrots currently. We are trying to teach her to drink water from a sippy cup, which she loves some days and other days she isn't interested. Typically, she takes a morning and afternoon nap for about 1 1/2-2 hours. She sometimes will take a third cat nap if we are at home. She goes to bed around 7 and wakes up between 6 and 7. 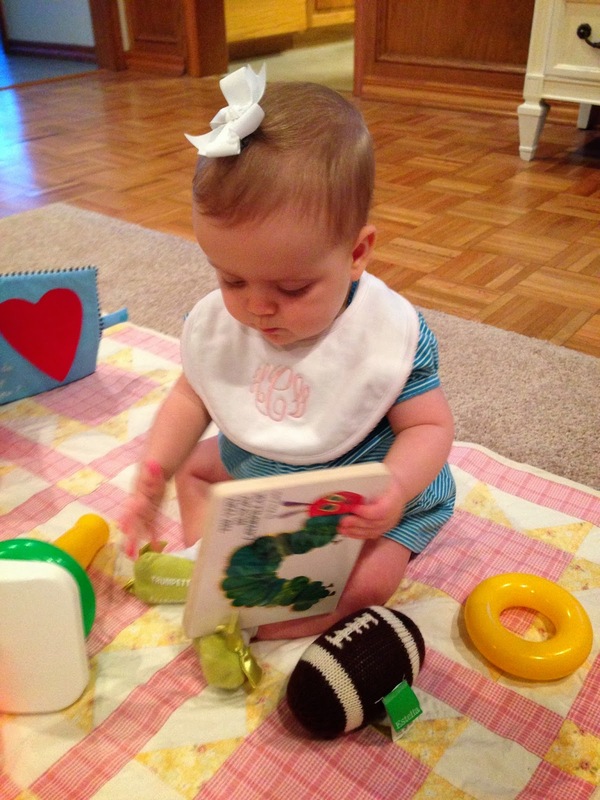 HG sits confidently while playing, and puts her arms back and flops backwards when she wants to lay down. 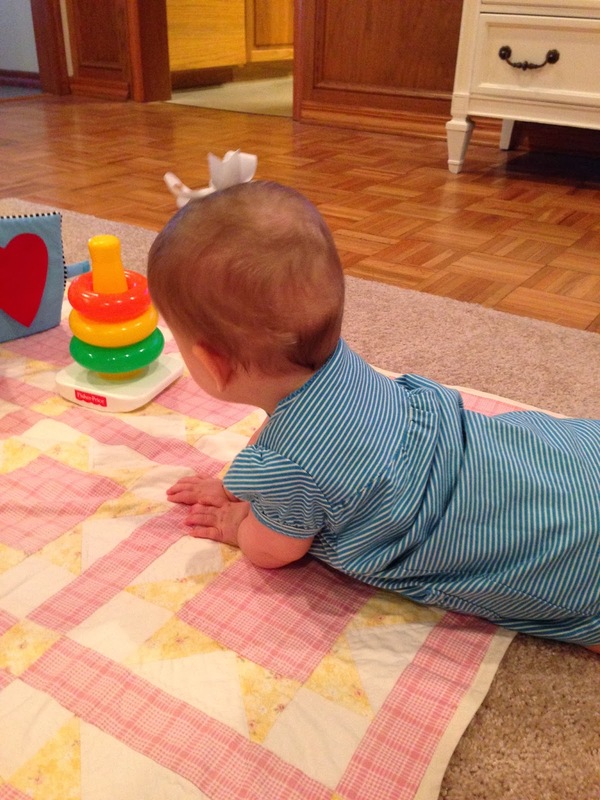 While playing on her tummy, HG will push her toes on the floor to try to move to her toys. When we put her on her hands and knees, she will hold the position for a second or so before resting. She rolls and scoots on her back to move around. She is grabbing at everything right now, hair, faces, toys,mugs, placemats...and is has an incredibly strong grip for an 8 month old. - HG is babbling a ton, all the time. At times she will just yell and scream so loud it hurts my ears. I have not figured out if the is any meaning behind the yelling, but she seems to like to hear her voice. - She still loves the mirror. - She prefers to cuddle with her Vera Bradley blanket my small girls gave her over other blankets. - She just started playing peek-a-boo with her burp cloth. 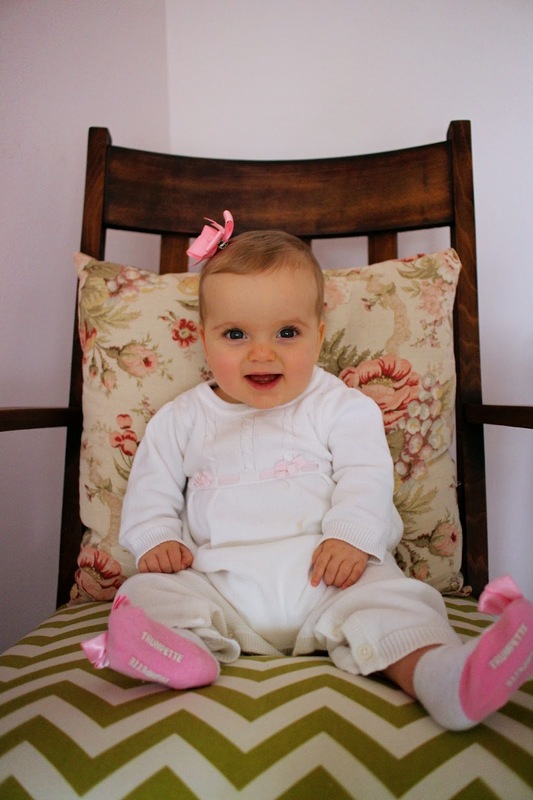 - She is ticklish on her tummy, her neck and the bottom of her feet. Today you had a stuffy nose and a cough. You would not nap at church this morning when we were watching your friend Iva, and when we came home you only napped for a short time in your crib. So, by 4 this afternoon you and I were both tired girls. I put you in the car to take dinner to Daddy before youth group, and hoped you would snooze in the back seat, but you just played and gave me smiles from your mirror. When we got home, a huge thunderstorm came through. (Here in Florida, when it rains it pours.). I took you to your nursery, fed you and tried yet another unsuccessful nap in your crib. You sounded so pitiful with your little coughs and sneezes. So I scooped you up in your favorite Vera blanket and cuddled you in your rocker, which was the same rocker I was cuddled in by my Mama, and the same rocker she was cuddled in. The rain poured down outside of your window, the thundered rattled the walls, yet you slowly closed your eyes in my arms. As I held you, I felt so blessed to have a healthy daughter, with 10 little fingers, 10 little toes. Your long eyelashes and sweet little lips I want to always remember. You won't be little forever, and skipped naps and constipation will feel like the silliest things to worry about soon enough. After Hatley-Grace was unable/unwilling to sleep in her pack n play for the high school retreat, I decided she needed to spend more time in the pack n play so she would be able to travel well. 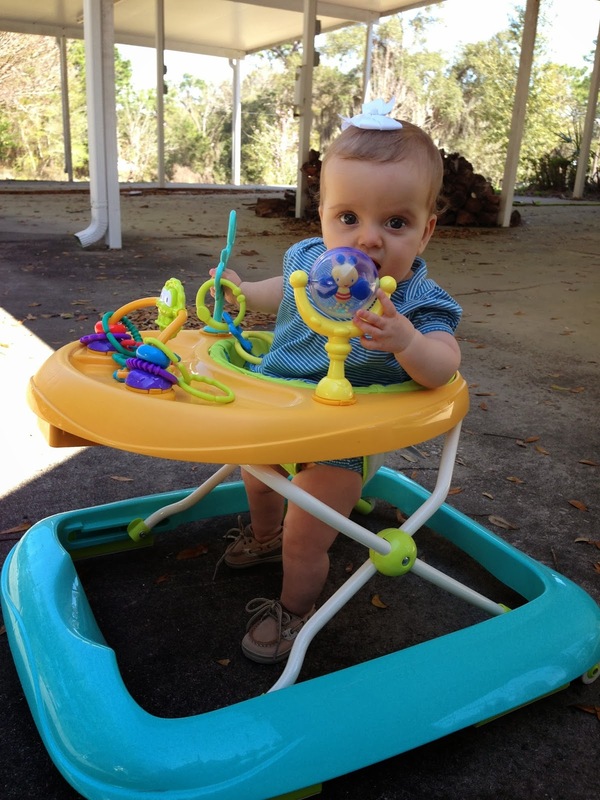 The past few days have been beautiful, so HG played with her toys while I sat in my beach chair in the backyard. 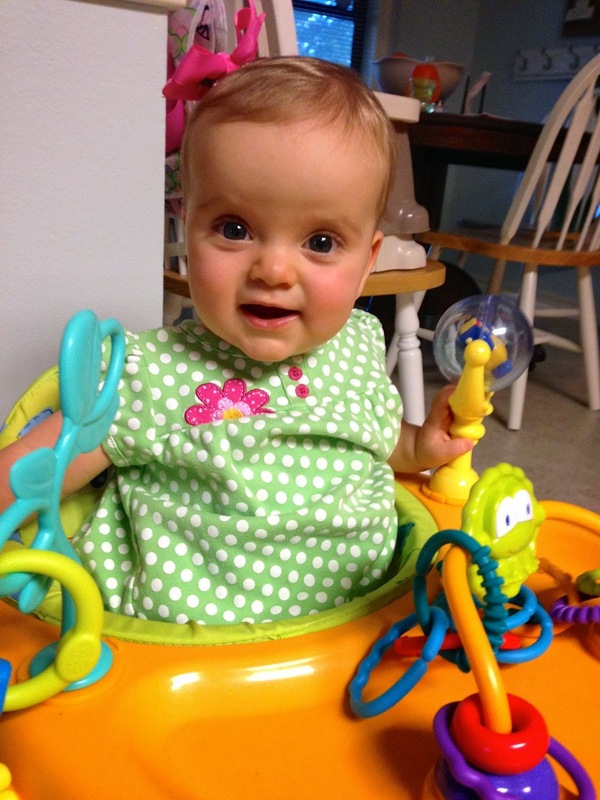 This week, Hatley-Grace discovered that she can open and close her hand like she is saying "hello" and "bye-bye". She doesn't do it at the appropriate times yet though, but will do it on command every once and a while. She has had some true 4 hour schedule days this week, nursing/eating at 7,11,3,7...and some true 3 hour schedule days, 7,10,1,4,7...when do babies ever settle into one predictable routine! She is a true joy, as usual. She is babbling up a storm saying lots of "babababa", and "mamamamama". She also has started some screeching which is a lovely breakfast noise. We need some rugs so the echoing stops. 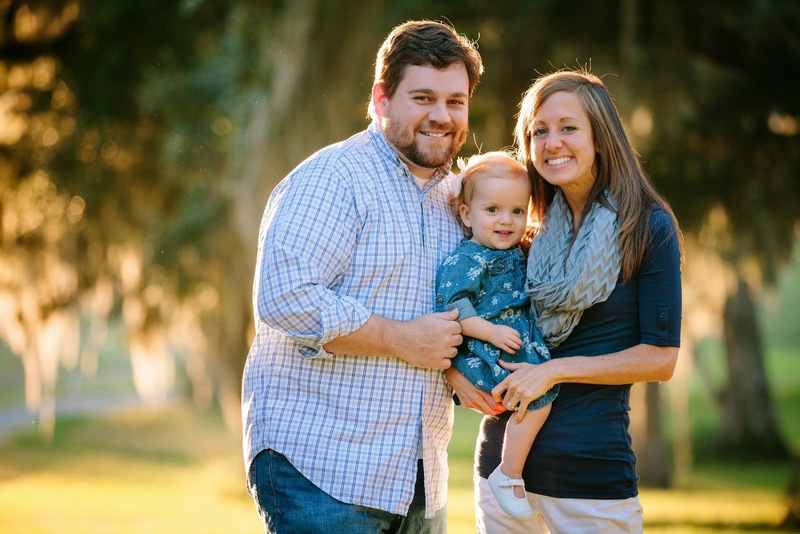 We hosted a family that was speaking at our church this weekend at our home on Saturday night. They have an 11 month old little girl, and boy was it fun to watch them interact. 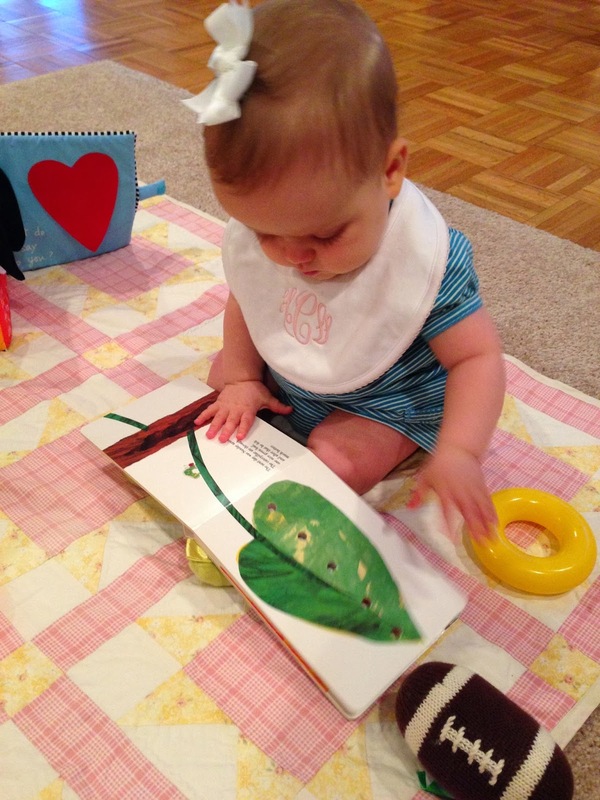 HG loved playing with her new friend, even when she was getting smacked in the face, or stepped on she giggled. She just loves other babies and constantly wants to grab their faces. When HG is tired, she has started folding herself in half and burying her face in the floor. She is quite flexible. She has also discovered that her toes taste good. Buying a house is stressful to say the least. As much as you think you can live an outdated space for a while, being around it everyday is sometimes hard. Living with undone spaces for me has been much harder than I anticipated. With over 3000 sq. ft, we are not going to be "done" settling into this home for a very long time. We do not have the budget or time to redo every space this year, or even in the next few years. I have learned to celebrate the little projects we get done, and the small spaces that are functioning better for our family. Focusing on these accomplishments helps me feel more at home in our new space. A small project that we have "completed" is an organizational center for our entrance from the garage into the kitchen. No one uses our front door, you have to walk around the entire front of the house to get there. So, most people enter through the garage right into the kitchen. This means purses, hats, coats, all end up on our kitchen countertops, which is hard when you are entertaining for dinner. I decided we needed something with hooks to hang all these things. We found some old wood in our garage and I sanded and painted it with Behr Cotton Fluff from another project. I got some basic hooks at Home Depot, and Marty went to attaching the hooks onto the board. The screws ended up being too long to go through the wood, so we added a wider board onto the back and Marty made the edges rounded. Then he was able to attach the hooks through both boards without going through the back. I like how it ended up even better with two boards instead of one, it think it is a little more finished. I covered a bulletin board that was left over from church with burlap. I used a 3M spray adhesive which made it very easy to cover. 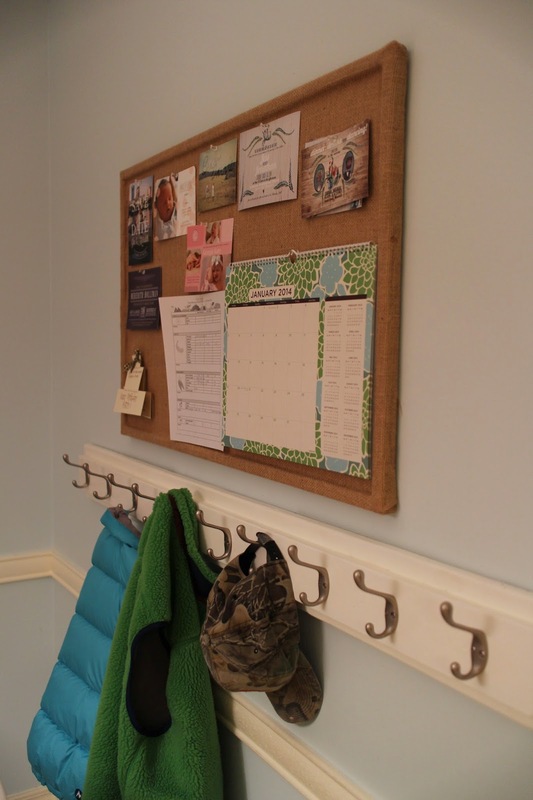 Overall, we only spent money on the hooks and burlap, which made this project very budget friendly. 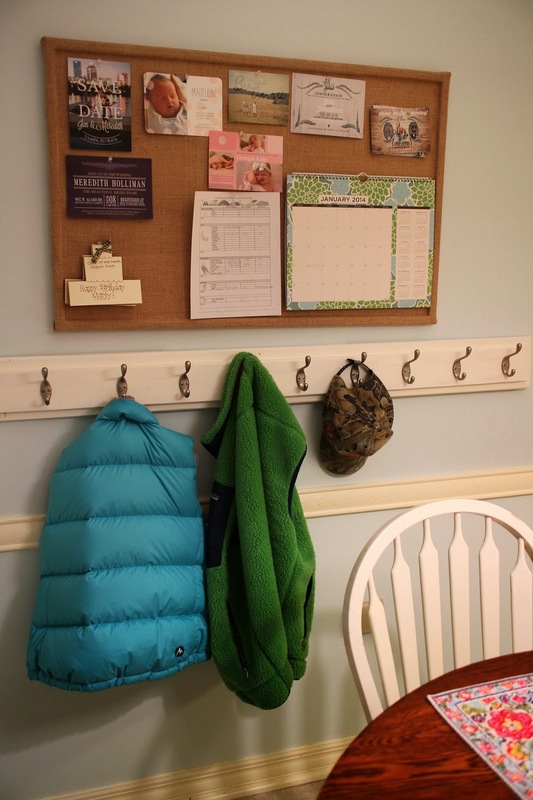 Would I rather have a beautiful organizational system from Pottery Barn in this space...yes, but this is working wonderfully for us so far and we did it with our own two hands! Yay for small spaces being completed!